How green is wind power? Four Norwegian research projects on wind power development presented at the NVE’s wind power seminar in Drammen. From left, Tor Håkon Jackson Inderberg (FNI), Cathrine Hagem (Statistics Norway), Mikaela Vasstrøm (University of Agder) and Stine Aakre (Cicero). Andreas Thon Aasheim (Norwea) and Tore Ivar Slettemoen (Njordr) commented on their presentations. How environmental issues are treated in the wind power licensing process was one of the topics at the NVE's yearly wind power seminar. 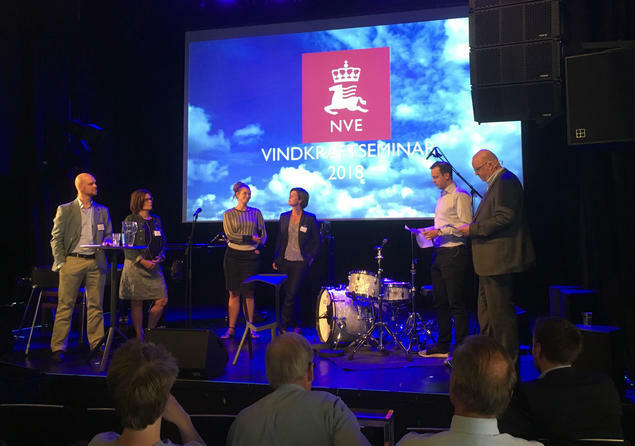 The yearly wind power seminar hosted by the Norwegian Water Resources and Energy Directorate (NVE) was held in Drammen 11–12 June. The seminar gathers representatives from the wind power sector, public authorities, NGOs and academia to discuss a wide range of topics related to the development of wind power in Norway. Wind power is growing in Norway, and currently 7 TWh wind power is under construction across the country – which is more than twice as much as the total production in 2017. From a marginal position in the energy system, windpower is expected to generate about ten per cent of the total annual electricity production in Norway by 2021. At the seminar, Senior Research Fellow at FNI, Tor Håkon Jackson Inderberg, presented preliminary findings from an FNI-led project examining how the Norwegian wind power licensing process integrates environmental concerns, and what influences whether a project is granted a licence. The seminar was also attended by FNI researcher Helga Rognstad and project leader Lars H. Gulbrandsen. – Dimensions like the placement and role of the licensing authority, who drives the licensing process, as well as type of stakeholder involvement have strong influence on process outcomes, including to what degree and how nature protection is integrated, Inderberg explained. With the new Planning and Building Act of 2009 the Norwegian windpower licensing and siting process was taken out of general planning procedures. Today, the process is hierarchically organised and nationally run by the energy sector, with the NVE and the Ministry of Petroleum and Energy as the licensing authorities. This formal change of the process has produced a set of informal practices for actor influence and environmental integration, Inderberg highlighted in his talk. One such example is the role of the municipalities, which are now formally a hearing party to the process, but informally has a very strong influence on licensing outcomes in cases where municipalities are negative to wind power projects. Inderberg also emphasized how the Environmental Impact Assessments are a key instrument to integrate nature protection issues in the licensing process, and that the quality of these assessments have improved over the years. However, exactly how and in what ways the different factors uncovered through the EIAs influence the licensing outcome are sometimes unclear. – Increased transparency in the licensing process would improve the predictability for project developers and other actors, and our understanding of how and to what degree environmental issues influence licensing outcomes. Currently, the weight given to the different factors remains at the discretion of the licence authority. This obfuscates comparisons and predictability between windpower projects, he stressed. The research project ‘Competing land-use pressures in Norway: Examining the integration of nature protection concerns in windpower licenses’ is financed by the Research Council of Norway (MILJØFORSK Programme), and has partners from Norwegian University of Life Sciences (NMBU) and University of Uppsala (Sweden). The projects runs until the end of 2020.